Shenzhou-8 undergoes testing in preparation for carrying out an unpiloted rendezvous and docking mission to the Tiangong-1platform. China is pushing forward on readying its first space station module for launch. Meanwhile, that country's first astronaut is openly discussing the prospect of China's future engagement with the International Space Station. 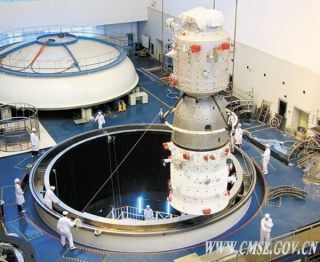 The 8.5-ton Tiangong-1 module, the first in a series of connecting rooms that will be launched into orbit, has been transported to the Jiuquan Satellite Launch Center in China's Gansu Province and is undergoing a final checkout before its liftoff on a Long March II-F carrier booster later this year. That one-two punch for China's space station undertaking would see the launching of the Tiangong-1 target spacecraft and the Shenzhou-8 spaceship in the third and fourth quarters of 2011, respectively, according to several Chinese news outlets. Take a look at how China's first space station, called Tiangong ("Heavenly Palace") will be assembled in orbit in this SPACE.com infographic. Now on site, Tiangong-1 is loaded with payloads and is undergoing final tests before its launch. During the recent Paris Air Show, a delegation from the China Manned Space Engineering Office accepted 300 flags from the International Astronautical Federation. These flags are to be taken to the Tiangong-1 target spacecraft. They are slated to be brought back to Earth by a Chinese astronaut when he completes China's first piloted rendezvous and docking linkup next year. In December 2010, the same 300 IAF flags were sent to the International Space Station via the Russian TMA-20 piloted spacecraft. They were delivered back to Earth by the space shuttle Endeavour in June 2011. Six of China's already flown astronaut corps take part in ceremonies marking a naming contest for elements of their space station program. In a July 8 press report, China's first astronaut,Yang Liwei, was vocal regarding his country's interest in International Space Station cooperation. Yang, who is also deputy director of the China Manned Space Engineering Office in Beijing, made his comments to a domestic audience in an online interactive broadcast. The growth of China's space program has been publicly praised by NASA officials. "China being in space I think is a great thing. The more nations that get into space, the better cooperation we'll have with each," astronaut Rex Walheim, who flew on the final space shuttle mission last week, said during an in-flight interview with Reuters. "Space is one of the biggest international brotherhoods we have." However, in his comments, Yang indicated that technical hurdles remain in pursuing such collaboration. Specifically, he emphasized that China's space station standards and the ISS docking standards do not agree. The unification of standards is the first problem to solve in the effort to carry out future space station cooperation, Yang said, according to China's Xinhua news agency. "This is the first time I am aware of that any high-profile official associated with the Chinese space program has made such a strong statement to the Chinese public on ISS participation," Gregory Kulacki, a senior analyst and China Project Manager for the Union of Concerned Scientists' Global Security Program in Cambridge, Mass., told SPACE.com. "And, as far as I know, it is the first time I have heard a Chinese official confirm that the docking hardware they will be using in the upcoming mission is not compatible with the ISS."